Meanwhile, we learn more about Sub Girl’s double life as the Hollywood actress Gloria Swanage. I had assumed that the two women were one and the same, with Swanage being an identity taken on by Sub Girl while in the past – making her trip back in time a causal loop, as she was already aware of Swanage’s fame. However, it turns out that the actress exists in her own right. Sub Girl is her spitting image, and stands in for her when Swanage is taken ill. 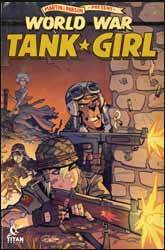 If I have a criticism of this issue, it is that the inclusion of a cut-out Tank Girl mask and a double-sided poster (showing the A and B cover designs by Brett Parson and Chris Wahl respectively) mean there are only 19 pages of actual comic strip this time, which is something of a shortcoming. What we are not short of, however, is Martin and Parson’s seemingly inexhaustible supply of comedy sound effects and exclamations, which this month include “Grint!”, “Gnu!”, “Stuff!”, “Titten!” and “Butter! Butter!” So all in all, it’s another successful mission from Titten – sorry, Titan – Comics.